I’ve been making this porridge for years, and only recently when my teenage son starting making it for himself, did I realize that I better share it. 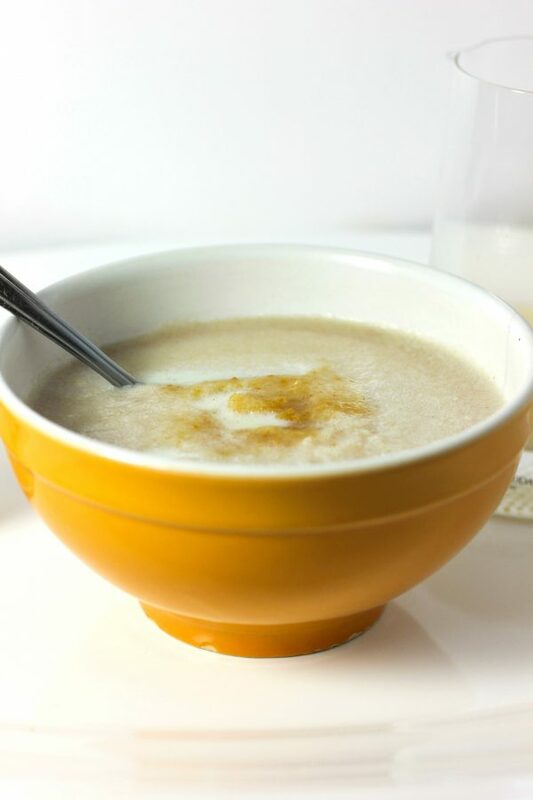 This Paleo porridge is very similar in flavor and appearance to Cream of Wheat, but it’s, of course, grain-free; and it’s comfort-food-delicious! With only 3 ingredients, it whips up in 5 minutes. I love it for an easy dinner or snack, great sleep and its gut-healing benefits. It’s Paleo, Keto, AIP and GAPS-friendly. But honestly, even without all these attributes, it’s just yummy! Porridge is one of the meals I miss, from the foods I used to eat. 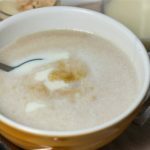 I used to love oatmeal and polenta and occasionally Cream of Wheat, although it wasn’t a staple in our house growing up. I think I discovered the phenomenon of this recipe by accident. I can’t completely remember. I am always fiddling with food in new ways, especially when I’m hungry and have a limited diet. This accident was a happy one. The texture is smooth, but nubby, just like Cream of Wheat (but healthier), soft and comforting. The porridge is usually served room temperature or cold. No cooking. You can actually eat it warm, if you prefer that; it works. It changes the lovely Cream of Wheat texture a bit. Basically you make the base mixture the same way, as instructed in the recipe below, but then the last milk (can be dairy-free) that gets added to the bowl as a condiment is hot. I’ve done this before and even added a tablespoon of butter (or coconut oil). It’s crazy-rich and lovely; the gelatin (an ingredient we’ll talk about in 1 second) melts a bit which changes the texture a bit; but it works — if you really need it warm. But somehow, I never notice the temperature of this treat while I’m eating it. It’s just GOOD. Okay, so that brings me to the 3 ingredients in this recipe! I just mentioned gelatin. Yep, it’s the key magical player in this recipe (as usual, for me). Interested in some of the other recipes where I’ve use gelatin in new ways? Here it is in dairy-free frosting; and find it here in GAPS Buttercream Frosting. Find my latest No-Bake Chocolate Chip Cheesecake here. Here I use gelatin in egg-free muffins. And here it is in Bulletproof Hot Chocolate! Learn here Why is Gelatin Good for You?! So gelatin is ingredient number 1! It’s great for gut-healing, better bowel movements, improved sleep and detoxification, to name a few benefits. If you follow the Paleo, GAPS or Keto diets: Slippery elm is ingredient number 2! Slippery elm soothes the gut, throat and lungs, helps with both constipation and diarrhea, is high in antioxidants that fight inflammation, and helps with bladder conditions. Read more about slippery elm here. If you follow the AIP diet: Tigernut flour is ingredient number 2! Depending on your healing diet, note this one ingredient variation! Tigernut flour is high in complex carbs, so it’s not ideal for Keto. And its starch quality is not okayed by Dr. Natasha for GAPS. BUT it’s an excellent complex carb for AIP and full of resistant starch for excellent colon health and microbiome well being. Plus, it tastes like graham cracker crumbs, so it’s a totally yummy ingredient. Together, these two ingredients (you choose which two) are gentle healers. Ingredient number 3~ In this recipe we combine the first two ingredients with your favorite high-fat milk of choice. For Keto, some GAPS and Primal folks like me, I like to use raw milk. It’s delicious! And Keto folks, you can even use raw cream, if you can get your hands on it. For GAPS, and Paleo dairy-free, use homemade nut or seed milk (ideally soaked for best digestion). For AIP, Paleo, Keto or GAPS, use high-fat coconut milk. To sweeten or not to sweeten is up to you. Both ways are great. I really like it plain, super wholesome and comforting. If you add stevia (Keto or GAPS) or honey (Paleo, GAPS and AIP) or maple sugar/syrup (AIP and Paleo option), it becomes comfort food in a new way, a healthy treat, like sweetened oatmeal at breakfast. Find your favorite way. As mentioned, a tablespoon of butter, ghee or coconut oil is extra-rich and a nice variation if you use hot milk at the end. Regarding stevia, if you haven’t already found one you love, I recommend this one. Lastly, if you’re Paleo and can have all of these ingredients, then go for it. 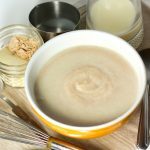 I make my own porridge with gelatin, slippery elm AND tigernut flour (find all these links at the bottom of the recipe). I use raw milk and/or cream + stevia. My son adds MCT oil and maple syrup to his as well. He’s my athlete, needs TONS of food and energy, and this is such a good snack for him after a huge dinner, hahaha: truth! Optional sweetener and optional MCT oil (find it here)! Using metal whisk, add 1 cup milk and optional MCT oil, stirring the whole time, to evenly dissolve and moisten the powders. They will begin to thicken, as they absorb the liquid, a lot within the first minute of stirring. 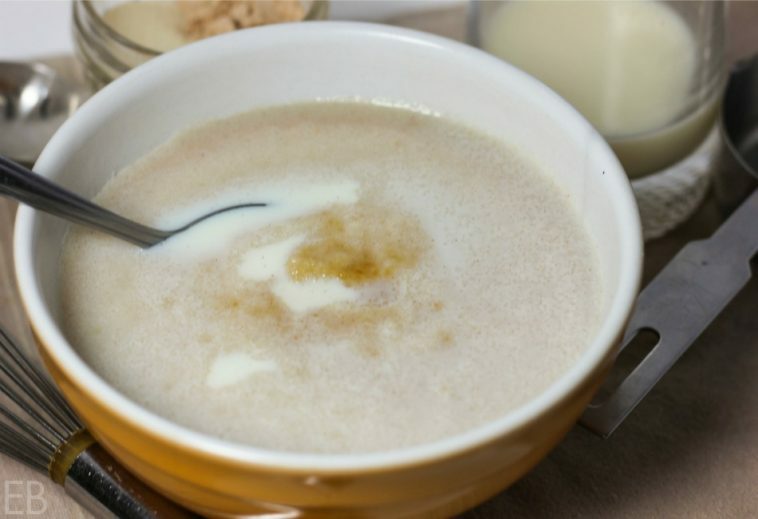 Add additional milk to your desired thickness, stirring it in or leaving it on top, depending on how you like to eat porridge, thick or thinner. Leave the porridge unsweetened, or add desired sweetener, to taste. Allow to sit and thicken 5 minutes. Add more milk and/or sweetener on top, if desired. Find the best gelatin here, sustainably-sourced, free of pesticides, grass-fed. Enter code BEAUTIFUL10 at checkout for 10% off your entire order. Find the best MCT oil here. How much is in a “scoup” of gelatin. I buy mine in bulk! This looks so good. I have gelatin, slippery elm, and tigernut flour, so I think I’ll try your version. Quick question…I really prefer cookbooks I can hold. If I order your book from amazon, is there any way I can get your videos and extra recipes? This. <3 Cream of Wheat was one of my all-time favorite breakfasts as a kid, right up there with Lucky Charms and Toaster Strudels! LOL! Seriously though, I am so excited to try this and see if it conjures up any nostalgic memories of my mom making this porridge for me on chilly school mornings. I always loved stirring chocolate chips into mine while it was hot. Ha, you went the extra dessert version, I see! 😉 Let me know how you like this ultra healthy version! I hope you love it too! xo, fun memories! Loving the texture of this, great recipe thank you! I’m so glad! You’re welcome. Thanks for commenting, Joni! so eager to try this! I LOVE tiger nuts, and have not had the flour in ages. Never tried slippery elm…is there a flavor to that? What else could it be used for? Hi Tessa, here’s a post on slippery elm: https://eatbeautiful.net/2016/07/03/2-new-gut-healing-ingredients-smoothies-tea-hot-chocolate-slippery-elm-marshmallow-root/ It’s got a lovely, cozy texture and flavor, herby but mild, meadow-flavored! I like it in hot chocolate or as a porridge best! 🙂 Thanks for the great question! Wow, wow, wow!!! I am in love with this recipe for several reasons – all that nourishing gelatin AND the slippery elm! My husband’s been using slippery elm a lot these last few weeks and this will be a fun way for him to enjoy some. AND maybe most of all, this made me have the biggest teary happy smile. You know how much my mommy meant to me and cream of wheat was one of her favorites from a young age and through her adult years. I wish I could have shared your nourishing and healthy version with her. I’m so happy to hear your memories, and love that the recipe is still relevant to you today, with your husband! Both of us warmed. Many hugs! I’ve never cooked with tigernut flour before but I really need to! This porridge sounds so comforting and I love that it caters to so many different diets. I know you’ll love tigernut flour, Jean! Thanks for your comment! Ingenious! I love that the texture is the same without using grains! Hi. I use changing habits gelatin, how much should I use as it doesn’t come with a scoop. Each scoop is 2 tablespoons; so the recipe calls for 1/4 cup total. Megan, can you clarify how much a “scoop” of gelatin is? I use a different brand than Perfect so need to know how many tsp/Tbsp to use. Thanks! Hi Allie, yes, and I updated the recipe! Each scoop is 2 tablespoons; so the recipe calls for 1/4 cup total. I’m intrigued! I’ve never tried tiger nut flour before, but I’ve always wanted to. Love all the other healthy additives in this porridge! Raia, like the article says, it tastes like graham cracker crumbs (meets bran); it’s also a little sweet! SUPER yummy and fun to work with and eat!! I can’t wait to give this recipe a try. Cream of Wheat was a favorite of mine as a kid and I do miss it. I have never heard of tiger nut flour, but looks like I need to get some ASAP. Thanks for this recipe. when I warm it up won’t it cook the gelatin? It melts it a little when you add hot milk. I talk about that in the post… 🙂 There is no other warming up, though, in the recipe. Looks like the ultimate gut-healing comfort food! I would also be interested to know the amount of a ‘scoop’ of gelatin. Thanks! Hi Carol, a scoop is 2 tablespoons, so 2 scoops is 1/4 cup. Oh man, this is such a great recipe development. So nourishing, so gut friendly, so EASY! I am just getting into trying more collagen based recipes and I’m pinning this to try as soon as the weather cools down. Great, Danielle! I am always thankful for the gentle nourishment I get from both collagen and gelatin. Enjoy! This was really delicious! I have no idea how you came up with such a yummy recipe with these ingredients. You’re a superhero. After I committed to making this, I realized I was all out of tigernut flour. I used almond flour and it was really tasty. I also added two tablespoons of coconut sugar because I like it sweet. Yum!!! Thanks for making me smile!! 🙂 I’m so happy you enjoyed it, and yay for your version too! Love how simple this recipe is. What a wonderful healthy gut healing breakfast ! Oh my, making my childhood dreams come alive in a healthy way. I am excited to give this a go. Megan, I see why tigernut is not for Gaps, etc. Why is slippery elm not okay for AIP? Hi Leslie, thanks for the great question. Quoting from autoimmunewellness.com, which explains Dr. Sarah Ballantyne’s reasoning: “This category includes aloe vera, slippery elm, chia, and flaxseed, all of which produce thick, mucous-like gels. Dr. Ballantyne recommends a great deal of caution with these foods for a number of reasons; they can hinder digestion, in some cases are high in phytic acid or high in phytoestrogens, and are shown to modulate the immune system. All of these effects can be problematic for those with autoimmune disease. Verdict: Aloe vera, slippery elm, chia, and flaxseed are NOT elimination-phase legal.” Beyond this, there is no zeroing in on slippery elm in particular. I’d love more insight, too, as all other herbal sources on slippery elm describe its mucilaginous properties as being gentle and healing. 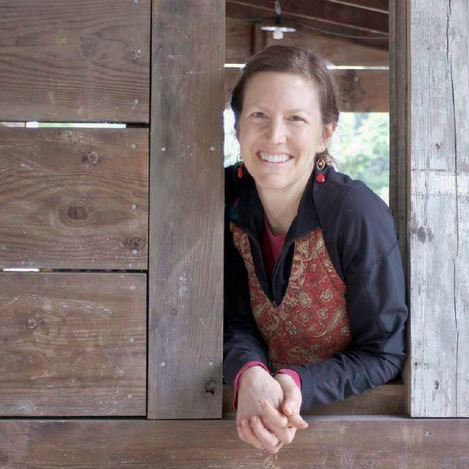 (https://autoimmunewellness.com/whats-in-whats-out-on-aip-answers-to-tricky-foods/) Since we know slippery elm is not high in phytic acid or phytoestrogens, we are left with “hinder digestion”, which must be her view on both aloe vera and slippery elm. Hi i wondered if there’s a best alternative to tiger nut flour, which I haven’t been able to find. Could I use coconut flour? Hi Nette, there’s a link for Anthony’s tigernut flour in the recipe, or here it is again, if that helps: https://amzn.to/2NOZKBt Nope, I woudn’t do coconut flour. You could try coconut butter for a variation. Good luck! Not AIP, but I used almond flour (the same amount) instead of tiger nut and it was delicious. That’s great, Jen! Thanks for sharing! So glad you enjoyed the recipe!